This is another post in the series Voices from Prison, which aims to shed light on the lives of asylum-seekers and migrants detained far from the public eye in Israel. 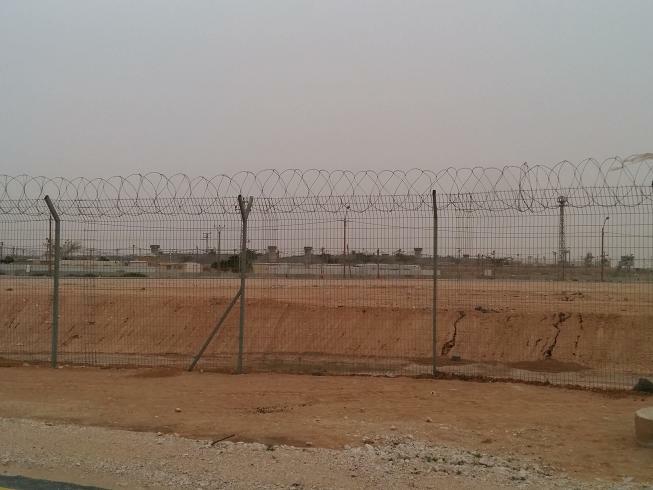 Last week I visited the “Holot” detention facility near the Egyptian border with two other activists of the Hotline for Refugees and Migrants. We went there to collect testimonies about the conditions in the facility for a report we’ve been compiling about Holot at the Hotline. The strongest feeling that flooded me throughout the visit was the hidden cruelty of this huge operation. At times, it’s possible to forget that you’re in a detention facility and imagine that you’re in an Israeli Army base or a reception center for migrants. 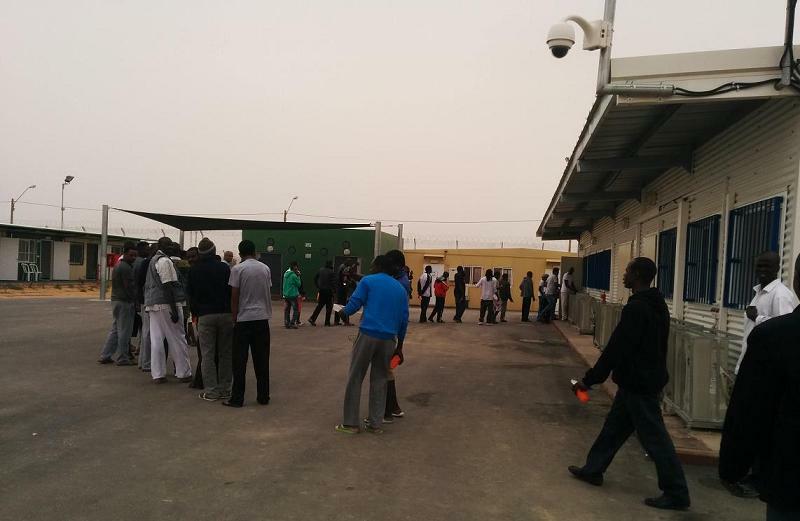 But talking to any one of the detainees will clearly demonstrate what Holot is. Many asylum-seekers whom I spoke to wanted me to be clear that it’s a prison, that their lives are managed by prison guards of the Israeli Prison Services, that they are completely dependent on the willingness and availability of the doctor in the facility to provide them with medical care, that prison guards randomly decide which items they are allowed to bring in from their previous life and which are locked in a container, that they cannot decide what they will eat and sometimes even how much they eat or at what times the meals will be served, and that they cannot cook for themselves. At times, one can forget that the asylum-seekers around me are all innocent, haven’t been convicted of anything, haven’t been charged with any crime. Everything runs in an orderly manner, an early waking hour, roll calls, clear rules. It’s easy to forget the illegality of the law keeping innocent humans in indefinite detention in the middle of the desert. The detained asylum-seekers reported that their concerns are not addressed by prison authorities and that instead, officials exert pressure on them to “agree” to “voluntarily” leave Israel to their homeland. 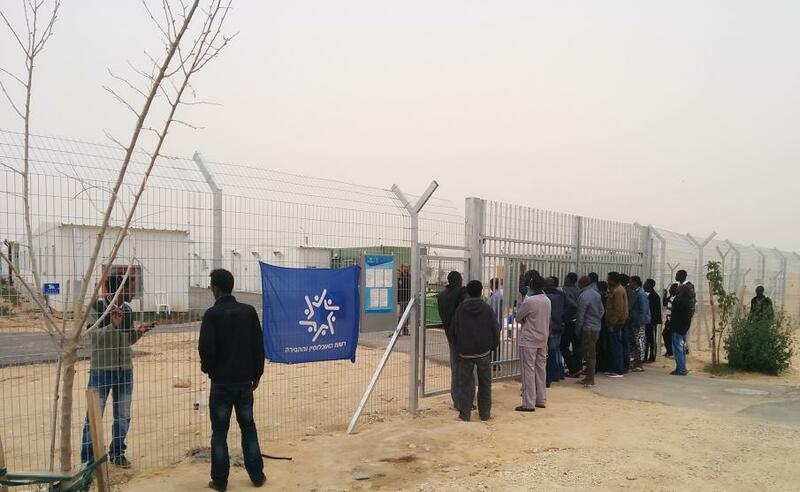 One detainee said: “Every time we approach the Ministry of Interior with our problems, they tell us we need to go back to our country.” Next to the gate of the Ministry of Interior office in prison where a group of refugees waited in line, only one placard was handing – about “voluntary” return. 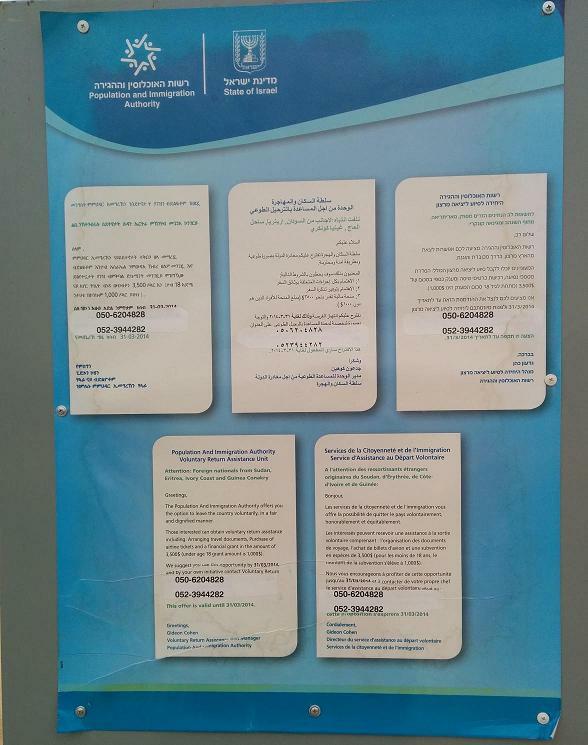 We could not locate any placard in prison about the possibility of applying for asylum in Israel (being recognized as a refugee is the only way to get out of indefinite detention, other than “agreeing” to be deported).